Bookmarks are mainly used to keep a person's place in a book. There are all kinds of bookmarks - blank ones, advertisements, pictures from books, animals, scratch and sniff, and more! 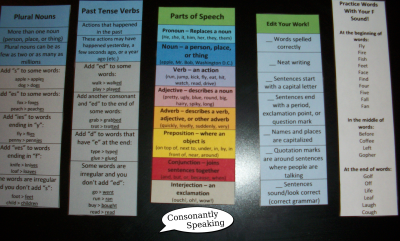 Bookmarks don't have to only be used to keep a place in a book, they can contain great reminders and visuals for activities in the classroom! 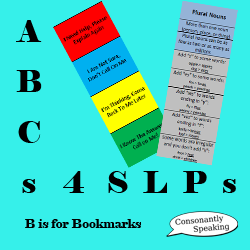 To help my students remember to use strategies they learned in speech therapy, practice their speech and language skills in the classroom, or provide a visual schedule/reminder for them, I created multiple bookmarks. At the end of this post are the following bookmarks I created available for download. 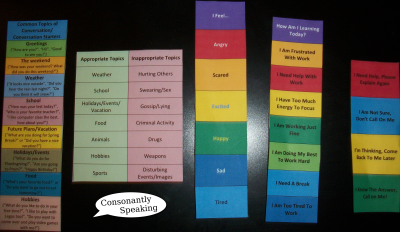 Read more to hear about and download the bookmarks I created for my students! These bookmarks are made for those who are good readers. I plan on making some with images in the future for early readers/those who have difficulty reading. Feel free to download any and all of these resources at the end of this post! Print them, cut them out, laminate them and you're ready to go!